These words are both pertinent and poignant. Pertinent because the world did dance to tracks that Rister co-wrote and co-produced; we’re talking blockbuster mega-hits like the Black Eyed Peas’ ‘I Gotta Feeling’ and many of David Guetta’s biggest hits, amongst them ‘When Love Takes Over’ (featuring Kelly Rowland), ‘Love is Gone’ (ft Chris Willis), ‘Memories’ (ft Kid Cudi), ‘GRRRR’, ‘Without You’ (ft Usher), ‘Who’s That Chick?’(ft Rihanna), ‘Lovers On The Sun’ (ft Sam Martin), and more. As Guetta’s main collaborator for many years, Rister played a central role in the creation of the three multiple-platinum Guetta albums from which these songs were culled: One Love (2009), Nothing But The Beat (2011) and Listen (2014). The poignant aspect of the inscription is reflected in the fact that it is written in the past tense, and that Rister’s output since 2014 has become sporadic. Earlier this year, Fred Rister released a single under his own name. Called ‘I Want A Miracle’ and featuring Chris Willis and Sam Martin, the song contains the lines “I want a miracle, show me a sign / ‘cause I don’t feel ready now, to say goodbye”, and all proceeds go to the Kidney Cancer Association. Not much reading between the lines is necessary here. Mercifully, this did not put Riesterer off music. He began DJ’ing in the late 1970s, in Dunkirk, and went on to work as a DJ for a local radio station. During this time he took on the artist name Rister. In 1989, Rister moved to Paris, where he became increasingly active as a musician. Amongst many others he worked with arranger Bruno Sanchoni and French-Gabon singer Abyale, and they had a European hit with a track called ‘I Wanna Be Your Lover Too (1990). Later that decade he released material under the artist name Mory Klein, and founded a duo called Ixxel, with Jacky Aru, and they had a hit with a track called ‘Drop That Beat’. In the early ’00s Rister worked with Portuguese singer Isabel Algarvio, who took on the artist name Anaklein, and became his wife. The two enjoyed several hit records in France. 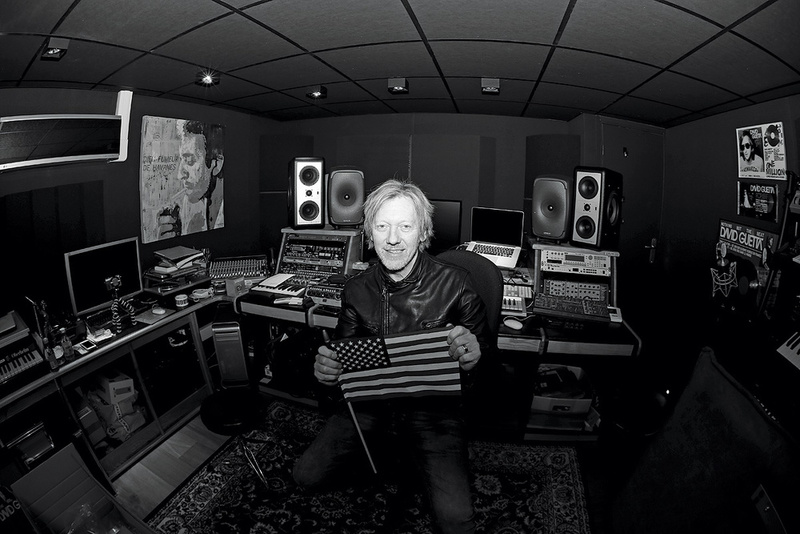 Fred Rister was thus already enjoying a successful career as a music writer and producer in France when David Guetta first approached him in 2004. Their collaboration became a momentous episode in both their lives. Guetta, in the interview elsewhere in this issue, says he recalls “every detail” of his collaboration with Rister, and the same appears to be the case for the latter. 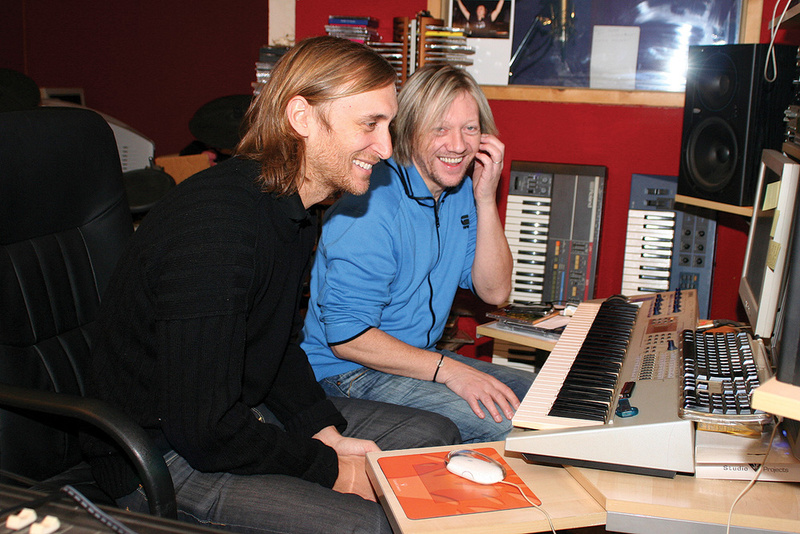 David Guetta (left) and Fred Rister at work during the sessions that produced the Black Eyed Peas’ ‘I Gotta Feeling’ and Guetta’s ‘When Love Takes Over’. Visible in the background is Rister’s Roland Juno 106, which was employed extensively in the early years of the duo’s collaboration. “One day a friend of David, Joachim Garraud, called me and asked whether I wanted to work on David’s new album. I told them I couldn’t do it, because I was working on an Anaklein album. So they went ahead and David made Guetta Blaster without me. Two years later, in November 2006, they called again, and asked me to make a demo. I did, and they called me about it while I was in a meeting in Paris. They said: ‘That’s good, but for sure, you can do better.’ I was pretty disturbed by this, and cancelled all my other meetings in Paris and went back to my place in the north of France, where I lived by this stage, and created a new demo. The first big Rister-Guetta hit had come into being, and many more were to follow. ‘Love Is Gone’ was released in June 18th, 2007, on the same day as the album from which it came, Pop Life, and was the most successful single from said album. Guetta asked Rister to work exclusively with him, to which the latter agreed, on the condition that he could also continue to work with his wife. Pop Life and ‘Love Is Gone’ proved stepping stones towards Guetta and Rister’s jump into the pop stratosphere, which came with Guetta’s next album, One Love (2009) and the monster hit ‘When Love Takes Over’, which has lyrics written with Australian DJ duo Nervo. Although he continues to be on an exclusive contract with Guetta, his health problems have meant that Rister has gradually contributed less and less to Guetta’s music, and was only involved on one track on 7, ‘Think Think Think’. According to Rister, there are two other factors in play here, one being that Guetta has a strong hand in the making of his own tracks, regardless of who he works with, the other that he has in recent years gravitated to more urban music, a genre with which Rister has little affinity. 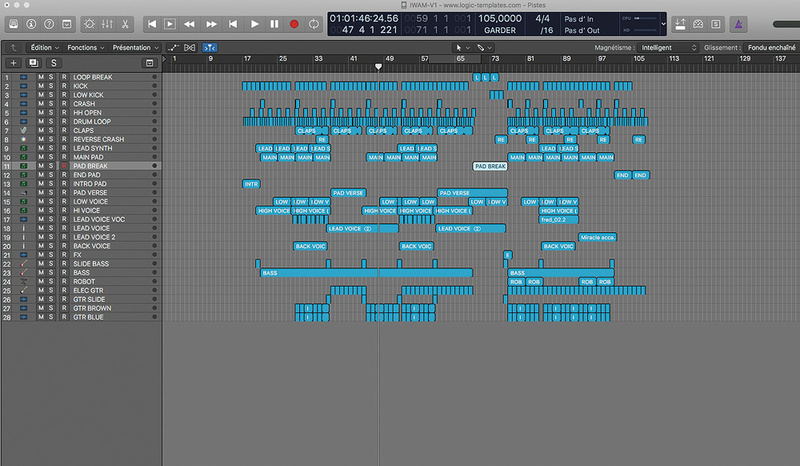 Fred Rister has relied on Apple’s Logic DAW for many years. This is the arrange page view for his recent release ‘I Need A Miracle’.Rister composed ‘I Want A Miracle’ at Catfield, and very deliberately constructed the arrangement so that it functions as a recapitulation of some of the music that inspired him throughout his career. “The song has a French touch, like Daft Punk. I played the bass, and there’s a vocoder and a Chic-inspired guitar, which reminds me of the 1970s. I asked Nile Rodgers to play but he couldn’t do it, so instead Dom Brown from Duran Duran played guitar. These are all elements I have enjoyed, and brought together in one song. The vocals were recorded at Jason Evigan’s place, and he and Sam Martin wrote the lyrics with me. I didn’t use Nexus or Sylenth for this song, but Native Instruments’ Kontakt, which is really good for piano and strings. 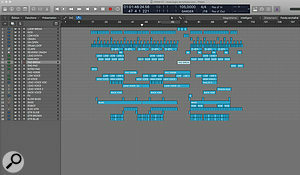 I did some of the drums in Kontakt and some in EXS24, the Logic sampler. 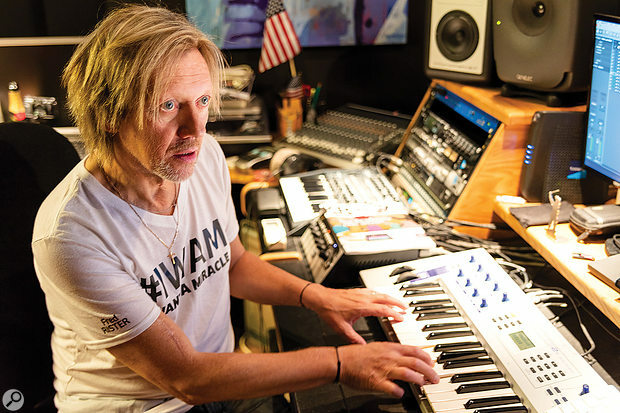 At the time, Fred Rister announced that ‘I Want A Miracle’ would be his last release; but since then, he’s released his own remix of the song, with substantial changes to make it more danceable, including a faster tempo. Another new venture is an autobiography, which will be published on October 18 under the title Faire Danser Les Gens (‘Making People Dance’). Note the absence of the past tense, and rightly so. Whatever way things turn out for Fred Rister, and we wish him the miracle he’s hoping for, the world will be dancing to his music for a long time to come.